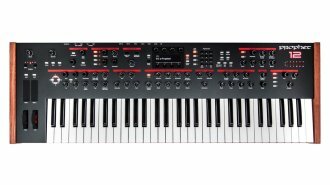 The Prophet 12 is the next step for Dave Smith's revered line of Prophet synthesizers. Each of the Prophet's twelve voices is composed of a brand-new hybrid digital/analog architecture that sounds different than any other DSI synth, yet retains the true Prophet vibe. With a humongous twelve voice polyphony, streamlined design, and sophisticated architecture, the Prophet 12 is ready to handle any sound you can dream up! The Prophet 12's brand-new hybrid voice has a digital front end followed by an all analog signal path output. Each voice has four high resolution digital oscillators (plus a sub oscillator), a digital character effects section, a resonant Curtis low-pass filter, a high-pass filter, a tune-able feedback circuit, a four-tap delay line with feedback per line, four loopable five-stage envelope generators, four syncable LFOs with slew and phase offset, a sophisticated arpeggiator, and a sixteen slot modulation matrix with 26 mod sources and 97 modulation destinations. The Prophet 12 is packed with a plethora of sonic potential and power! The digital oscillators can be frequency- and amplitude-modulated by each other with incredible accuracy. They can be freely assigned in whatever operator and modulator configurations you would choose. You can even assign each of the oscillators to modulate LFOs, envelopes, and filters. The Prophet 12 is the most cutting-edge hybrid synthesizer on the market and defines what a modern polyphonic synthesizer is. Designed and manufactured in San Francisco, the Prophet 12 has a glorious combination of form and function in a sturdy, yet refined and elegant build. Dimensions: (L x W x H) 38.4 x 12.8 x 4.15"